Palettes of Vermont is a statewide community arts project designed in the broad style of the marshmallow bales of Barnet, pigs of Brandon, moose of Bennington, and horses of Manchester. The bales, the pigs, the moose, and the horses have added significantly to the tourism traffic in their communities and across the state. They make pretty good folk art, too. Governor Jim Douglas, S.A.F.F. Executive Director Karen Bresnahan, Brandon folk artist Warren Kimble, and artists from across the state were on hand January 10 as the Vermont Arts Council launched the Palettes of Vermont in the Vermont State House. "It was packed," said Ms. Bresnahan. Palettes of Vermont will be the largest statewide arts exhibition ever. 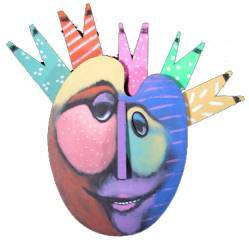 Folk artist and VAC trustee Warren Kimble conceived the year long community arts project. The Vermont Wood Manufacturers Association has produced more than six thousand blank Vermont maple artist palettes for distribution to individuals and organizations around the state. The launch included an exhibit of completed palettes and demonstrations by painter Liza Myers and textile artist Judith Reilly plus demonstrations by Art Costa, mask-making, Chris Jeffrey, glass, Anni Mackay, textiles, and Janet Van Fleet, mixed media. "It was exciting to see the artists' perspective on the palettes," said Ms. Bresnahan. "Chris Jeffrey took the wooden palette as a template and cut one out of glass, so he made a whole stained glass palette. It was awesome A chocolatier did an entire palette in chocolate with truffles which represent the different colors and a paint brush. "S.A.F.F. is very excited to announce that Palettes of Vermont is coming to St. Albans," said Ms. Bresnahan. "This is an exciting opportunity." We want to see how thousands of Vermonters can turn a bare slab of wood into art. 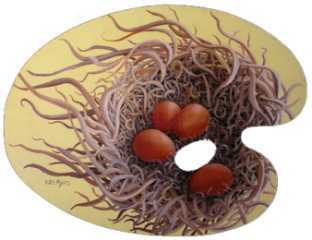 Sample palettes by Vermont artists include Patterns of Vermont by Warren Kimble as well as Vermeer's Cats by Joan Curtis, Hunting Scene by Dolores Furnari, Spike by Robin Kent, Peonies by Edward Loedding, Marsh Eggs by Liza Myers, and The Tenor by Peg Racine. Now it is time to think local. Palettes of Vermont can also be the largest Franklin County arts exhibit. S.A.F.F. will host a working session with folk artist and VAC trustee Warren Kimble Friday evening, January 20, at 6 p.m. at St. Albans City Hall to kick off the individual and group participation in area exhibits and events. And there will be plenty of events. "[Mr. Kimble's] intent is to get folks who have some association with artists to the meeting," S.A.F.F. Executive Director Karen Bresnahan said. "He'd like artists there but we also need community people who want to work and drive it. What the project is going to look like in St Albans, what our concepts are going to be, and how we're going to present it." Palettes of Franklin County (Vermont) is all-inclusive. The performing arts were incorporated when the Vermont cloggers performed, banging on the wooden palettes. And there is room in the books for another Guinness record attempt in St. Albans. Mr. Kimble will explain the details, answer questions about the statewide project, and help us focus on local events. The timetable includes a statewide gallery showing from July through October. "We need to have at least a couple of Franklin County events on the calendar. We'll get organized over this month and have artists working on it through February and March," Ms. Bresnahan said. "We will have our initial showing at the Maple Festival." That showing will be a featured place in the All Arts Council exhibit in the Robert Bliss Memorial Auditorium on the third floor of the St Albans Historical Museum. Free elevator rides included. It could also include a giant Maple Festival float and much, much more. "The energy and creativity has no bounds," Ms. Bresnahan said. "The more creative we can get and the more people we can get into the process the better,"
Palettes of Vermont is open to all Vermonters, not just professional artists; it offers an opportunity for people to become engaged in their local communities. 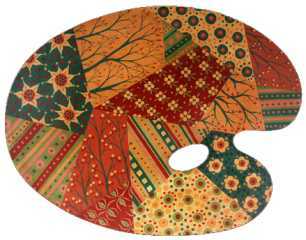 The palettes will be exhibited by the All Arts Council, A.C.E., S.A.F.F. plus other organizations throughout Vermont. The palettes will spawn exhibits, charity auctions, a palette parade float, and more.